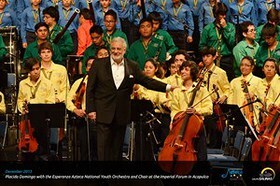 Grupo Salinas, a group of dynamic, fast-growing and technologically advanced companies, deeply committed to the modernization of the countries in which they operate and founded by entrepreneur Ricardo Salinas, is pleased to announce that Placido Domingo and the Esperanza Azteca National Youth Orchestra and Choir performed a benefit concert on December 28 for more than a thousand people at the Imperial Forum in Acapulco. As a continuing effort to support victims of deadly flooding this fall, Placido Domingo, Guerrero Governor Angel Aguirre, Acapulco Mayor Luis Walton Aburto and Grupo Salinas Chairman Ricardo B. Salinas have reiterated their commitment to the affected families. The benefit concert included the participation of 215 youth from across Mexico, as well as the sopranos Angel Blue and Micaela Joy West, who joined the tenor Placido Domingo, under the direction of Maestros Eugene Kohn and Julio Saldana. Ps.14,627,000 collected through Movimiento Azteca and Tiempo de Ayudar. Three water treatment plants were sent to the emergency area. Two million water purifiers were donated by Fundacion Azteca. Partnered with the Mexican Red Cross to deliver tons of groceries donated by Mexican society. Partnered with the State Government to deliver mattresses and household goods to affected families in San Pedro Cacahuatepec. project is a model for self-assisted reconstruction, with additional support from the federal, state and municipal governments, as well as private donors.